Prior to the reception, there will be a lecture by Prof. Bas c. van Fraassen from 3:00 - 4:00pm. Please join us as we remember and celebrate Adolf Grünbaum with a lecture by Prof. Bas C. van Fraassen, Adolf’s first Ph.D. student in 1966, followed by a reception filled with family, friends, and warm memories. ABSTRACT: A half century ago I had the great fortune to study with Adolf Grünbaum, and I would like to share some of my memories of that time. 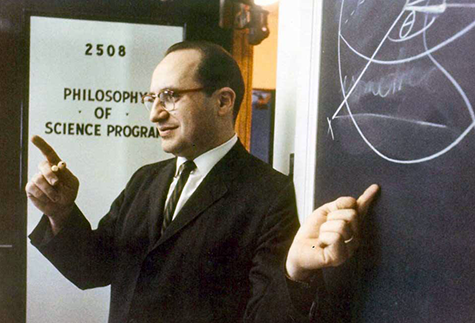 His insightful studies in the philosophy of physics were truly inspirational, and I will discuss these in the context of the several decades surrounding the year 1963, when I became his student. I will focus on his critique of certain interpretations of quantum mechanics, and his continuation of Hans Reichenbach’s philosophy of time and space.